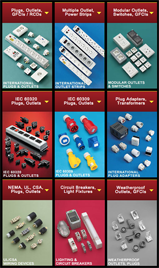 Worldwide "Search Products By Country"
Modular Receptacles, Selector: "All Countries"
GFCI, RCD, Modular Outlets Weatherproof "All Countries"
"All Modular Products On One Page"
Entire List of "Multiple Outlet Power Strips"
"All IEC 60309 Products On One Page"
Custom lengths and shielded cords available. Various terminals, custom stripping, hanked cords available. IEC 60320 C-15 120C type connector available on some models. © International Configurations, Inc. All rights reserved. International Configurations Inc. stocks, manufactures and distributes International, European, North American worldwide power cords, detachable cord sets and hospital grade green dot marked power cables. Our European and International, "Country specific", power cords can be found by using the "Search Power Cords by Country" search feature on our homepage. Available in the Country specific power cords sections are power cords and cables that are agency approved, certified and REACH, RoHS and CE compliant where applicable. In many instances specific Country electrical configurations are known worldwide as plug type A, B, C, D, E, F, G, H, I, J, K, L, M, N. We have developed a worldwide electrical configuration power chart and guide to assist with determining and selecting County specific plug type and plug types. Use this handy link for selecting plug types and plug type for cords, plugs and connectors, power strips and power outlets. The link to our plug type A, B, C, D, E, F, G, H, I, J, K, L, M, N, is Worldwide Electrical Configuration Power Chart and Guide. Our domestic power cords include NEMA straight blade and NEMA locking power cables. Power cable types include 15 amp 120 volt NEMA 5-15 cables, 15 amp 120 volt NEMA locking L5-15 cables, 20 amp 120 volt NEMA 5-20 cords, 15 amp 120 volt NEMA locking L5-15 cables, 30 amp 120 volt NEMA locking L5-30 cord sets, 15 amp 220 volt NEMA 6-15 cables, 15 amp 220 volt NEMA locking L6-15 cables, 20 amp 220 volt NEMA 6-20 cord's, 20 amp 220 volt NEMA locking L6-20 cord's, 30 amp 220 volt NEMA locking L6-30 power cords, NEMA locking L14-20 cables, NEMA locking L14-30 cables and high power 16 amp up to 125 amp at 120 volts through 415 volts IEC 60309 detachable power supply cords and cables. Direct link to Nema straight blade power cords at NEMA Straight Blade Power Cords. Direct link to Nema locking power cords at NEMA Locking Power Cords. 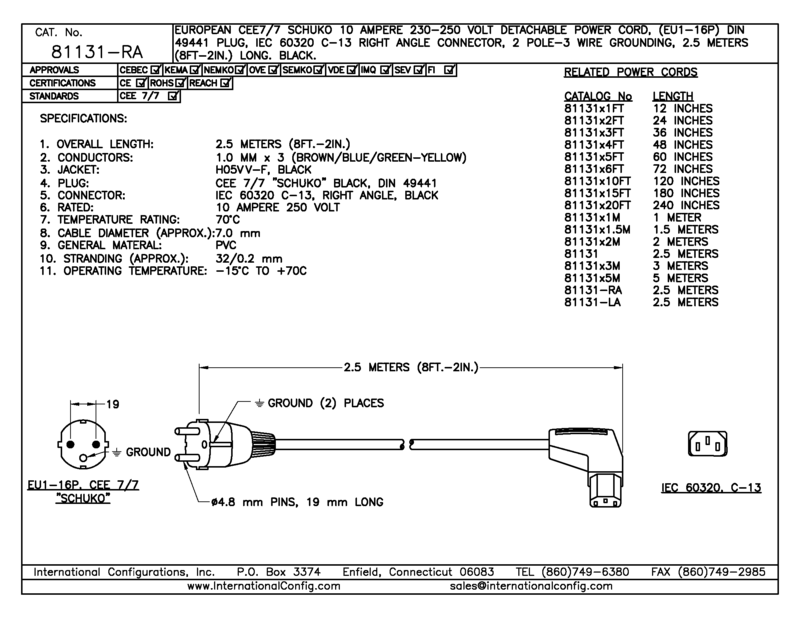 Direct link to IEC 60309 power cords at IEC 60309 Power Cords. Our North American and Canada hospital grade power cords are viewable at this link. Hospital Grade Power Cords Green dot hospital grade power cords are manufactured in various lengths and plug color options. Clear hospital grade plug cords, gray hospital grade plug cords and black hospital grade plug cords that are produced with detachable C-13 and or detachable C-19 molded on connector ends or with unterminated ends for direct hard wiring to equipment. Hospital Grade power cords are also known as Medical Grade power cords. View Medical Grade power cords and cables at this link Medical Grade Power Cords. Our green dot, UL approved, hospital grade cables meet applicable agency and testing requirements for use in hospitals, clinics, institutions and medical faciities that need high quality durable hospital and medical grade power cords. Our International IEC 60320 are manufactured in a complete range of lengths for Data Centers, computer equipment, business machines and original equipment manufactures needs. These IEC 60320 cables meet applicable cord standards and agency approvals for C-13 to C-14 cords, C-14 to C-19 cords, C-19 to C-20 cords, C-15 to C-14 cords, C-20 to C-13 cords, C-5 cord sets, C-7 cord sets. Short power cords to long power cord versions available that start at 12 inches long then incrementally increase in length by the foot and go all the way up to 25 feet long cables or longer if needed. Direct link to IEC 60320 C-13 to 14 cords is IEC 60320 C-13 to C-14 Power Cords. Direct link to IEC 60320 C-19 to C-20 cords is IEC 60320 C-19 to C-20 Power Cords. Since we manufacture power cords custom length power cords and cables can be manufactured to specific requirements usually within 2 weeks. Various length power cord or extension cord can be manufactured in our USA or overseas facilities. International configurations products are available through our Company network of websites. Our "Primary Main Website" InternationalConfig.com contains all of our products on one site. Visit Main Website InternationalConfig.com. Our "Modular Components" Electrical products selector website can be viewed at this link Modular Component Selector Website. Our "IEC60309 Components" Electrical products selector website can be viewed at this link IEC 60309 Component Selector Website. Our "Power Cord and Cord Set" cord set selector website can be viewed at this link Power Cord and Cord Set Website. International Configurations is located in Enfield, Connecticut. USA . International Configurations products are manufactured in facilities thought-out the world and are installed on electrical / electronic equipment and in construction sites around the world. Products we manufacture, stock or distribute are certified by relevant regulatory approval agencies meet product standards, both foreign and domestic.